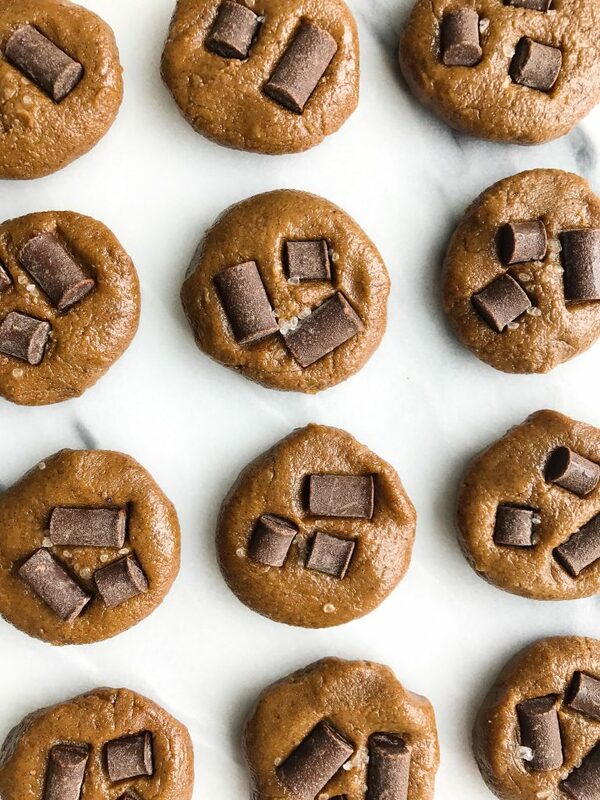 Fudgey No-Bake Chocolate Chip Freezer Cookies for a delicious vegan and grain-free dessert! Cookies are life. But no one is turning on their oven when it 90 degrees in August (unless you are me and are nuts). 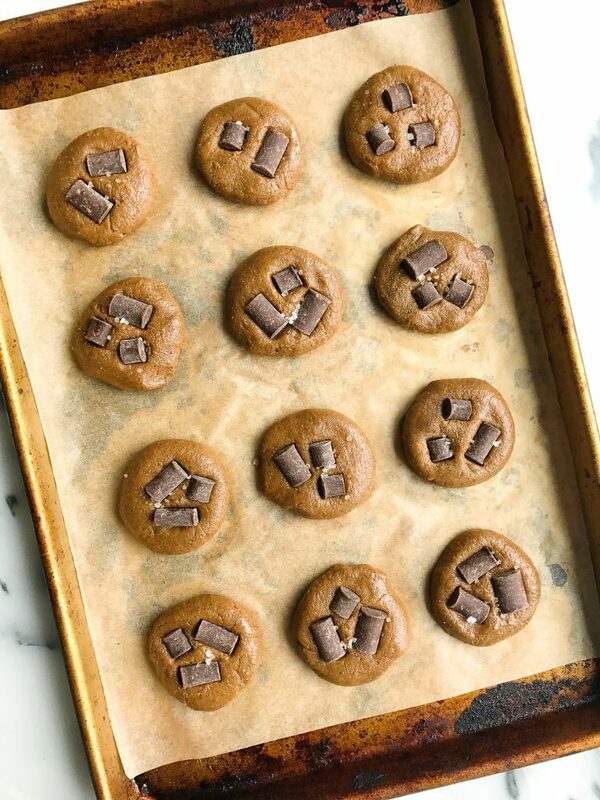 That is why we are making these Fudgey No-Bake Chocolate Chip Freezer Cookies. 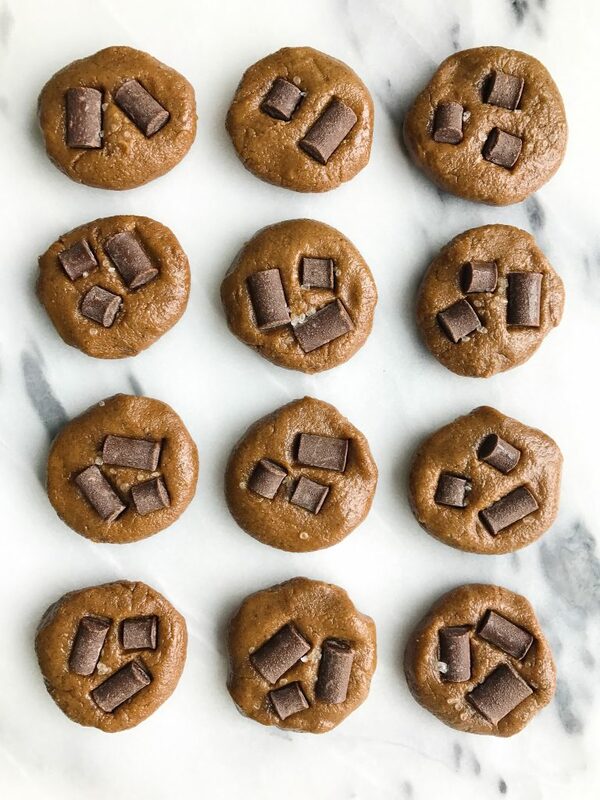 All you need are a few of my favorite ingredients, a food processor/blender and a FREEZER to make the cookies. They are extra fudgey, totally delicious and they are relatively low in sugar for cookies if you ask me. They are filled with healthy fats, they have protein in them and they won’t give you that carb overload that many cookies to. As you probably have noticed, I don’t really bake with many oils besides coconut and avocado. 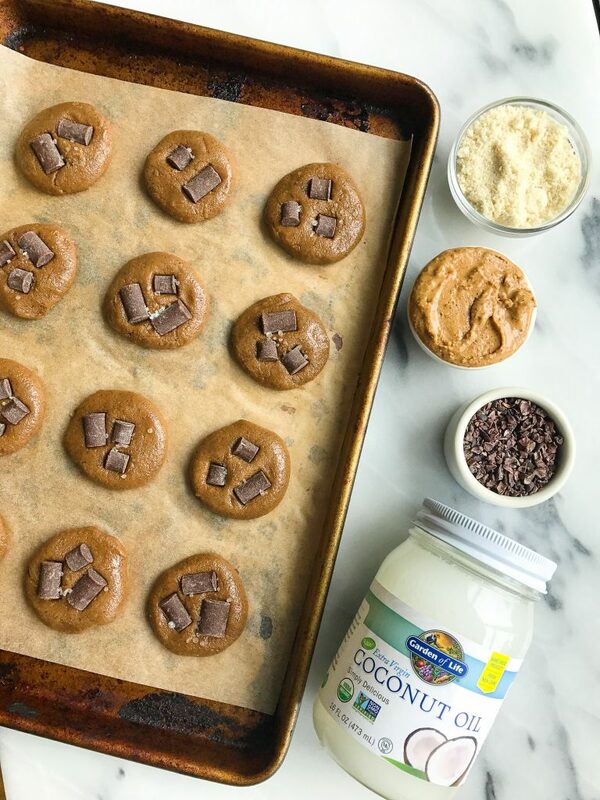 These cookies are made with my favorite coconut oil ever from Garden of Life®. I have 2 jars open at all times (each for a different use). Usage number 1 is food obviously. I melt it in the microwave or over the stovetop to turn to liquid when needed but in the summer it pretty much turns to liquid itself. I love to cook veggies in Garden of Life’s Raw Extra Virgin Coconut Oil and love love to caramelize bananas with it. And for baking, SO good. Usage number 2 is for my hair and skin. Yup, slathering my ends with coconut oil for extra moisture and hydration (more on that here). I also use it for my skin and when shaving. It is amazing and has my skin feeling all kinds of smooth. Please do keep two jars open if you are going to use it for food and body/hair. Or scoop some out and put into a tupperware just to keep it separate. You may remember Garden of Life from those amazeballs Mini No-Bake Oatmeal Breakfast Bowls. What I love about Garden of Life is the amount of amazing products they have. It isn’t just supplements or vitamins or protein but they have a variety of other products you can use daily like this coconut oil! Now let’s freeze these COOOOOOKIES! Add to freezer for 20 minutes and enjoy! *Store in freezer in airtight container for best quality, up to 3 weeks! Thank you Garden of Life for sponsoring this post. It means so much to me to work with brands that I love and who support rachLmansfield! Any excuse for cookies and NOT turning on the oven, I will take! Its 90+ in Seattle this week, and we so seldom reach these temperatures that hardly anyone has AC. UGH!! But freezer cookies, these I can/will do! YUM! Do you have a good nut free substitute for the almond butter and flour? I would love to make these but my son has tree nut allergies. Thanks! sunflower butter + oat flour ! Can I make w unflavored collegen powder?